Well the National Pilot is off to Panama...no idea if her overly expensive flight attendant is with her. But who cares? The Govt doesn't. It won't end because Madam PM has decided nepotism is the way to go. In her absence Errol of clan McLeod is serving. And, the kuchoor for this week done start. Week's ago at the first meeting of Take Back De UNC, Basdeo Panday warned that the current UNC executive would do nasty insidious things like tamper with the voting lists. Well De Bas aint talk a truer word. Imagine that Mikela Panday, who once served as an MP for the party and Basdeo Panday, the founder of the party, are missing from the list of names? This kuchoor thick like my mother dhal! Is it that the UNC party really that corrupt, boy? Is they own people they will turn on so? Or was it an error? This "editing" of the lists effectively prevents Mikela or her dad from voting in the upcoming elections of contesting any positions......Colour Me Orange with this one, oui! And Little Jack Warner competition in the elections is the former Youth Officer...I smelling more than dhal in this pot! Well it seems that Ancil Roget have more clout than even I realise. After he threaten to leave the MSJ last week, this week the MSJ locate its testicles and challenging the government. Now they giving the Panchayat an ultimatum....get things done by May 24th, or else.....lewwe wait and see how the backpedal on this one going and work, folks! On the PNM front their Tunapuna councillor on foolisness. If you know you representing the people of the nation...the entire borough or regional corporation, not a specific party, then what you doing with a sign with the Balisier on it? Symbols on signs establish territory. And to insist on keeping up that sign, you might be winning your territorial battle to assert your PNM til yuh dead self....but those of us (ME) who aint burying in a balisier flower would like it if your municipal office remained logo-free except for the Coat of Arms....on that note I also wish that all religious symbols be removed from ALL GOVT offices....is either we putting ALL symbols or NO symbols. In a bid to divert us from the constant muck they are mired in the Integrity Commission unveiling a 3-year plan. Does this mean there will be a structure and a plan to the bacchanal???? 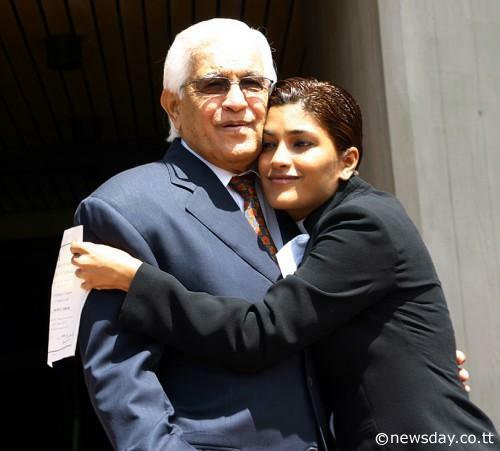 In more "vengeance is mine news", the ruling that denied Israel Khan permission to wear Nehru-collared suits in court has been reversed. I wonder what transpired to make this back into an issue again????? Sigh...it's Monday....De Vice Cyah Done!